Christmas is coming! 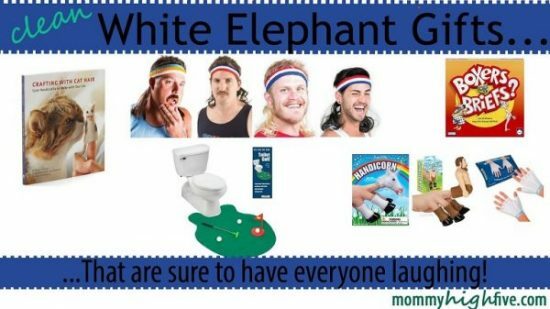 Here are some funny and clean white elephant gifts for your party. 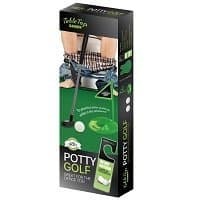 Looking for a good white elephant gift for your Christmas party this year? It’s my goal every year to come up with the best idea for our party. After ten years of tradition and laughter, I’ve seen a lot of funny ideas. I’ve also seen a lot of duds. So, here are some great ideas to keep the party going. White elephant parties aren’t for the faint of heart. Mix your conservative grandma with your least conservative friend and things can go awry. So, if possible, you’ll want to invite people with similar personalities. 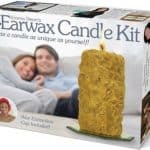 If you wait til the last minute to decide to have a white elephant party you’ll likely get the typical gifts from your guests. Toilet paper, a can of beans, and an old pair of shoes might have been funny back in the 90’s, but it gets boring after a while. If you give your guests time, they’ll likely come up with more creative gifts. I don’t mean with your gift, I mean with your party. Opening white elephant gifts is fun but doesn’t usually take more than a half an hour. We typically like to play fun party games, have an ugly sweater party contest, or have everyone bring their favorite dessert. 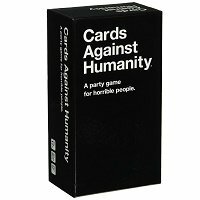 If you need some ideas, I’ll give you a list of my favorite white elephant party board games below. If you’re inviting couples, does each person need to bring a gift? What about price limits? Also, if everyone brings two gifts, does one need to be useful while the other one is the white elephant gift? How about homemade white elephant gifts? If guests know the answer to these questions beforehand, it’ll improve the experience overall. There’s nothing that goes better with inappropriate talk and behavior like some good food. Have everyone bring their favorite. Here are a few great white elephant gift ideas that are all under $25. If spending money isn’t your thing, I’ve also listed some good homemade white elephant gift ideas below. The mullet headband is pure handsome. Once you put it on no one will stop starting at you. 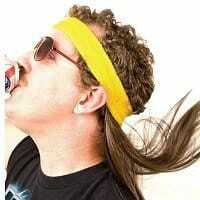 If you’re not part of the mullet trend, you’re just in the way. Better yet, now you can be part of the trend and simply remove it when you need to part of a serious conversation. 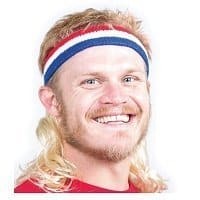 There are lots of mullet headbands out there including but not limited to: the Bobcat, the Widowmaker, the Weekender, and the Tailgater. Still, the one I’d go with is the Bobcat, as it’s built just a bit better than the other options out there. It comes in blonde, brown, or black hair so no one will even notice it’s there. If you truly want it to match I’d go a shade lighter for most. 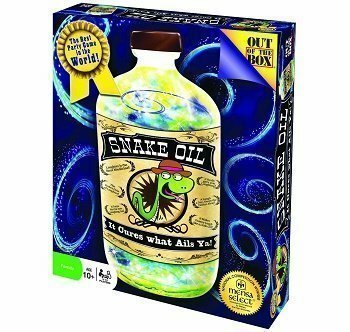 It’s under $10 and makes our list of cheap and unique white elephant gifts under $10 as well. 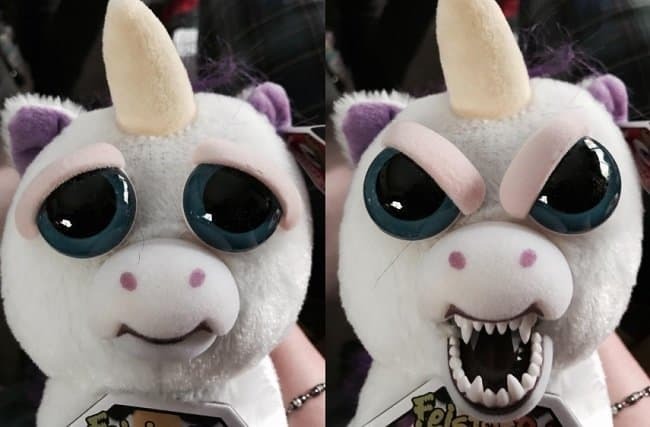 Unicorns may seem fluffy and nice but in the inside they’re holding back a lot of aggression. Take Glenda Gliterpoop for example. One minute she has a cute face and pouty eyes. The next, she’s ready to chew your arm off. Seriously, this little unicorn (measures around 8.5″) is a total hit at white elephant parties. It’s easy to squeeze the doll and have it make the angry face and it’s quite the transformation as you can see above! Imagine the joy of seeing amazing pictures like these every single day on your calendar. We’ve made a few of these in the past by printing out photos, laminating them, and then binding them together. I guess someone decided to take the idea to the next level. Here are two pretty funny options. Keep in mind that whatever you go with, you’ll have to look at it all year round. 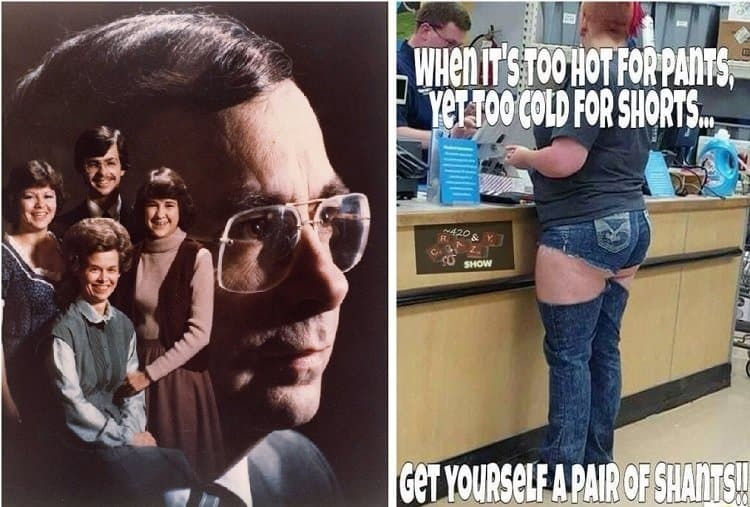 You can go with the awkward family photos that never should have been taken or the 365 days of the People of Walmart. As you can see in the images above, either one is a classy choice. Fingerwear is all the rage this year. 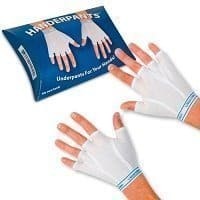 In the last few years, I’ve seen several items from Accoutrements, the company behind the Handerpants, at our white elephant party. 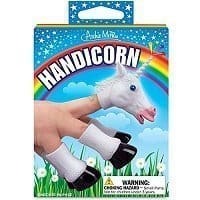 One I’m excited about this year is the Handicorn, which allows your hand to look like a majestic unicorn. Ever dreamed of being a unicorn? Now you can be one, or sort of, or at least your hand can be. 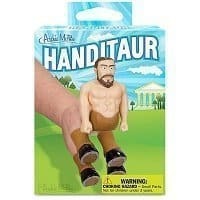 Accountrements also makes a handipug, handihorse, finger hands, and other funny options to put on your hands. These are always a hit. Whether you’re out and about with your kids, by yourself, on a date, or just living life, you never know when you’ll hit a code brown. 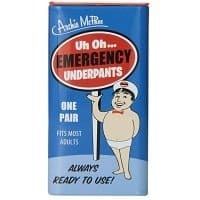 Let these emergency underpants be your beacon in a fog of brown. 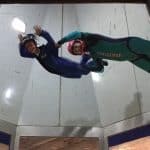 Now if you’re unsure about how things turned out down there, you can just get rid of the problem and feel confident again almost immediately. On a more serious note, my wife and I could have used a pair of these at Disneyland with our middle child this past year. Accidents are no joke, but now you can make them into one! For my father-in-law, a game of golf could be the difference between making a sale and falling short. 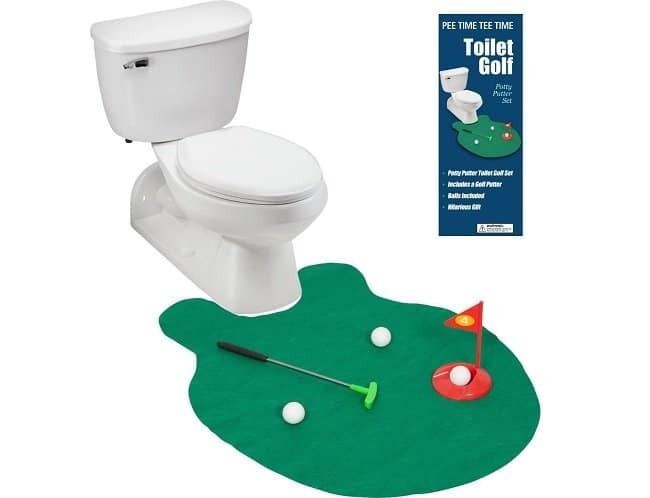 Since the difference between a good golfer and a bad golfer is mainly in the putting game, the Potty Putter gives you an opportunity to practice at various times throughout the day. In the past, I’ve recommended a lot of different books from “What’s Your Poo Telling You” to “50 Shades of Bacon”. This year, I’m recommending you go with something that will change your life. 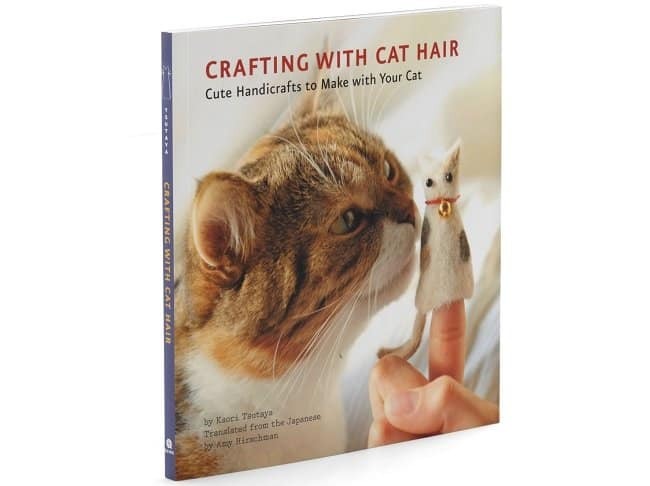 “Crafting With Cat Hair” is a real passion for many owners out there. This book shows you how to transform those clumps you find around your house into amazing works of art. You can create everything from a tote bag to a picture frame using the leftover crafting material from your cat. 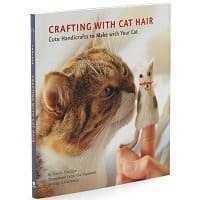 You could also pair this book with the book “Knitting with Dog Hair”. As that book says, it’s “better a sweater from a dog you know and love than from a sheep you’ll never meet”. Truer words were never spoken, kind of. Looking for something a little more useful? 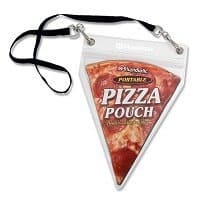 Try this portable pizza pouch. 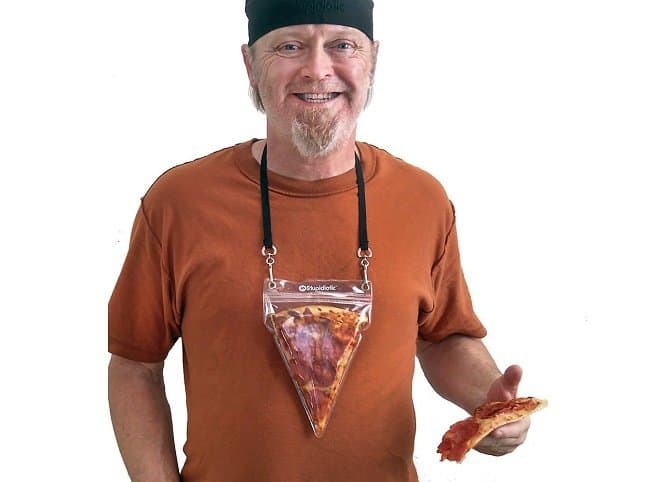 It’s perfect for road trips, or taking your lunch to work, or for that bonus piece of pizza you forgot to eat out of the box. The neck design is portable and it has a reusable zip lock seal. If you’ve ever wanted to know what it feels like to be a horse, unfortunately you’ll have to wait for the right dream. 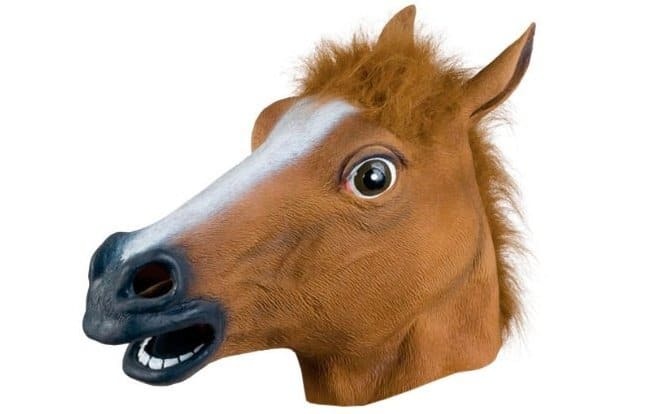 The next to best thing in reality is the horse head mask which allows you to not only pretend to be a horse, but the life of the party as well. Horse hooves can be added to your hands to make the illusion feel even more real. 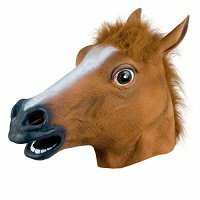 Don’t want to be a horse? No problem! This is also available in a squirrel, pigeon, pug, magical unicorn, chicken, bald eagle, and other designs. Another good option for your white elephant gift is a funny t-shirt. 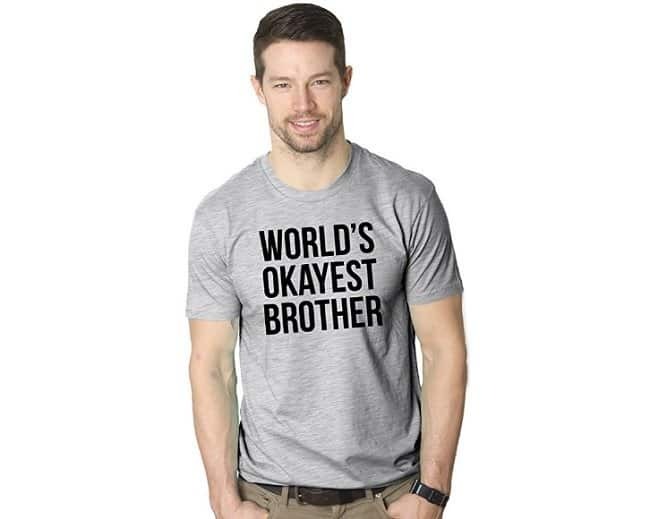 Although there are unlimited options I could show you here, the one that we chose to feature on this article is the “World’s Okayest Brother”, which we just thought was okay or kind-of funny. Other good options like Vladimir Puting and Donald Trump riding a pig can be found on this page. 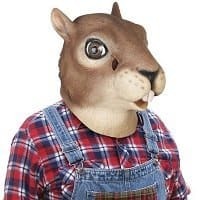 Get into the redneck spirit of Christmas with this is a hilarious gift option for your white elephant gift exchange. 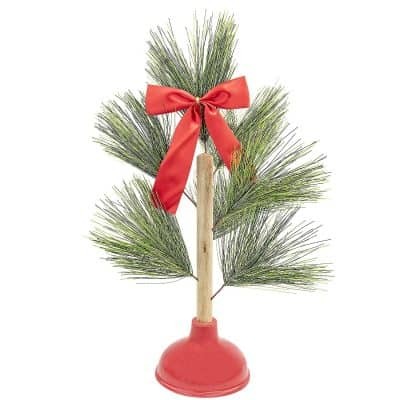 What makes a better white elephant gift than a plunger dressed up as a Christmas tree? Rednecks everywhere would rejoice to get this under their Christmas tree. This gift can capture even a few more laughs with a little dirt thrown on the plunger to make it look like it has been used. Didn’t like any of the ideas we had above? Make a homemade white elephant gift. 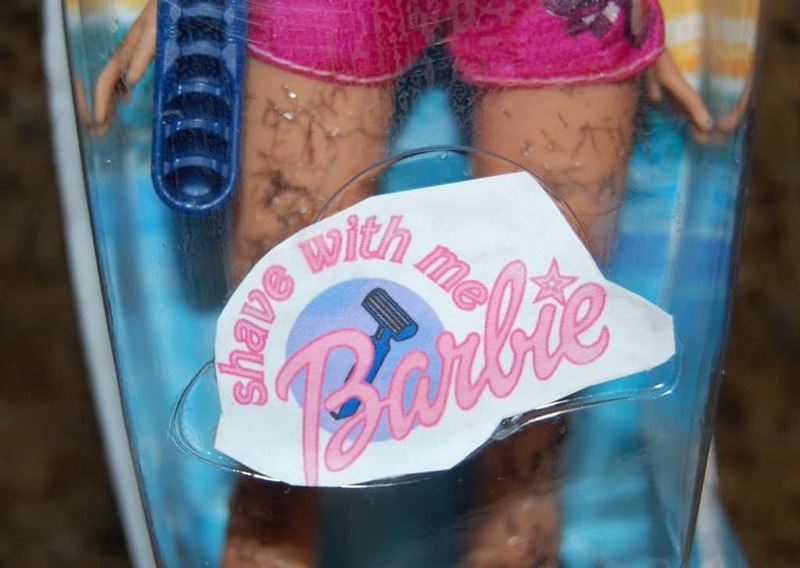 One fairly easy one we’ve done in the past is a shave with me Barbie. Get a cheap Barbie from the dollar store. Cut off a bit of the back of her hair. Take the cut hair and glue it to all the unsightly places you can think of. Put the Barbie back in the plastic case. Add a Razor and a sign. Voila! You’ve got the funniest gift of the entire party for less than $2. What’s a good white elephant party without some good and funny party board games? Here are a few that have worked great for us in the past. Admittedly this card game is going to be completely inappropriate for many people. 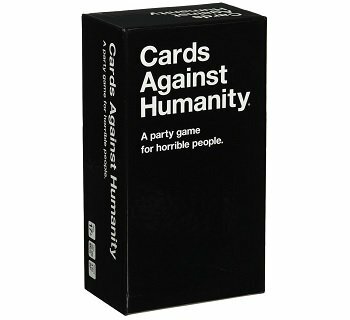 It does advertise itself as “a party game for horrible people” so be aware of that if you decide to get it. Still, it’s the number one board game right now, so there must be a lot of horrible people. The rules are as simple as a game like Apples to Apples. Someone picks a black card and the other players answer with their funniest white card. Again, for the sensitive out there, I’m warning you now that this game can be inappropriate, racist, and overly sexual at the same time. So, if that’s not you or your group of friends, try out one of the other options below. I’ve never seen my Dad laugh as hard as when he plays this game. He’s a terrible artist, but that’s what makes it so fun. 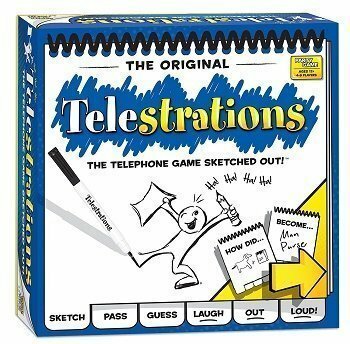 If you’ve never played Telestrations before it’s basically like the drawing version of the classic Telephone Game. 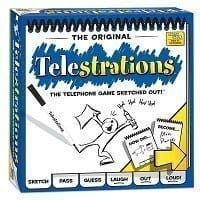 I’ve played this in a group with kids and a group of adults and have always had a good time. 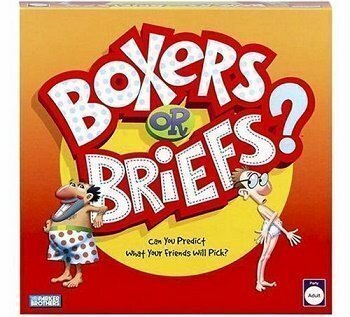 If you’ve ever played Apples to Apples, then you know the basic rules of Boxers or Briefs. You have a set of cards in your hand and you’re trying to convince one of the players that your card is either the funniest or the truest answer. 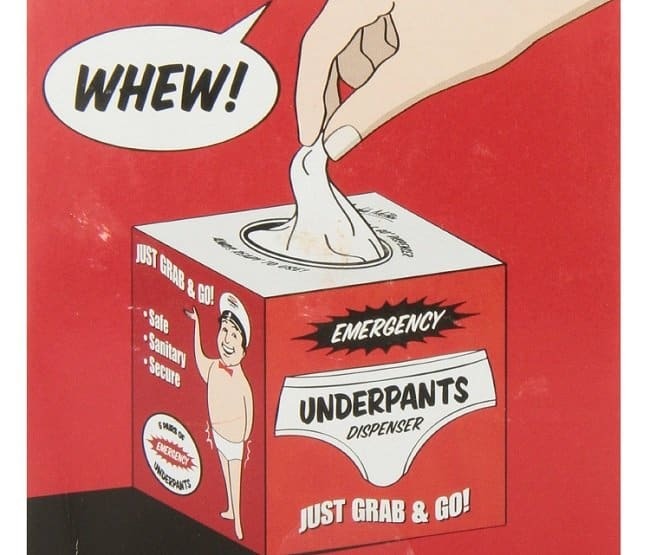 Fortunately for your white elephant party, Boxers or Briefs is a bit more inappropriate than Apples to Apples. That being said I’ve played this with my parents and my kids, and it’s not so inappropriate that someone will get offended. This is one of those games that everyone has to be excited about in order to be fun. I’ve had a couple laugh so hard you cry kind of moments playing it as well as a couple boring games. At this point the inventors take two cards from their hand, put them together, and the invent something that they think the customer will want the most. When it gets really funny is when people are willing to act out the part and really work with it. Imagine selling a lightning bra to a ninja and you can see what I mean. We’ve also done a more homemade game with this saran wrap ball. Place some gifts inside and saran wrap them as you see in the picture. To play, start by having someone roll dice until they get doubles. Using their hands only they have to unwrap the ball without tearing the Saran Wrap. As soon as someone else gets doubles the ball gets passed to them. Guests keep what they unwrap. To make it more difficult we’ve also had the guests wear gloves! A white elephant gift exchange, called Yankee Swap by some, has rules that are different for just about everyone. The basic premise is the same. Everyone brings a gag gift and exchanges it. Ultimately, you can do it however you like, but here are some basic guidelines to go by. Place all the gifts in the center of the floor. Decide who goes first. This can be done in a number of ways: closest birthday, name out of a hat, best costume, or whatever you want. Go around the circle at least one more time, allowing your guests to steal gifts from each other. Once a gift has been stolen twice it’s “locked” and can’t get stolen again. The gift exchange can go pretty fast without some additional rules. Here are some we’ve used before to stretch it out a bit. In order to steal (or open) a gift, you need to roll dice until you get doubles. Anything wearable needs to be worn by the opener. Your white elephant party can be the best of the year if you make it that way! What are some gifts you’re giving out this year? We’d love to know. Let us know below.